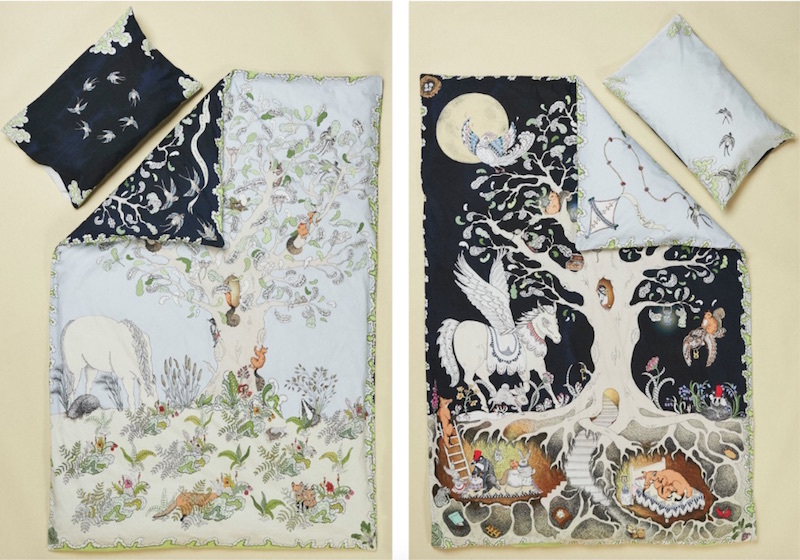 Making up bedtime stories for our kiddos is a time-honored tradition, but imagine nature-inspired bedding that actually helps parents and children embrace the world of storytelling and fantasy. Forivor's beautiful duvets, blankets, and wall hangings fill this tall order: the detailed hand-drawn illustrations depicting woodland and magical creatures are sure to inspire some epic tales! One side of the bedding shows forest life in the daytime, while the other side offers a striking nighttime contrast. Forivor's Enchanted Forest designs shy away from the typical cutesy illustrations, offering a more elegant, fantastical style that will intrigue your children for years. Forivor’s Kickstarter campaign ends tomorrow, and they have well-surpassed their goal but would welcome additional supporters. There’s no mystery behind the items’ popularity; the fact that all the offerings are reversible makes us feel like we are getting two beautiful pieces for the price of one! Forivor also strives to make the storytelling experience even more fun by including a set of Junior Character Cards with the duvet set. The cards feature fantastical creatures and their magical powers on one side and actual facts about animals and wildlife on the other side. There are even storytelling questions and cues to further the creative conversation. In addition to the duvet (which comes with a matching reversible pillowcase), Forivor is offering a lux quilted blanket that can double as a playmat or as a duvet for smaller beds. Little ones won’t miss out on the storytelling fun either. Forivor includes a set of Baby Character Cards with prominent black and white illustrations and more basic animal descriptions and sounds. Both the blanket and the duvet come cozily packed in an organic cotton suitcase that can be reused for storage. There’s also an impressive wall-hanging that is hand-embroidered by a fair-trade women’s cooperative in India. The detail is stunning, and the piece would create conversation whether in a child’s room or yours. If you have bedding covered, Forivor Kickstarter perks also include coloring posters and greeting cards. Forivor was designed to get families thinking and dreaming about nature, and the company has done its homework in forging a philosophy with the planet’s well-being at the forefront of its mission. Forivor’s bedding is produced using pesticide-free organic cotton that has been cultivated using rain water, and the character cards are created by an environmental printer. Forivor’s current line focuses on bedding, but plans are already in the works for a wide range of interior products. In other words, the company is aiming to make your days and nights as dreamy as humanly and humanely possible. Forivor's Kickstarter campaign ends tomorrow, and they have well-surpassed their goal but would welcome additional supporters. There's no mystery behind the items' popularity; the fact that all the offerings are reversible makes us feel like we are getting two beautiful pieces for the price of one! Forivor also strives to make the storytelling experience even more fun by including a set of Junior Character Cards with the duvet set. The cards feature fantastical creatures and their magical powers on one side and actual facts about animals and wildlife on the other side. There are even storytelling questions and cues to further the creative conversation. In addition to the duvet (which comes with a matching reversible pillowcase), Forivor is offering a lux quilted blanket that can double as a playmat or as a duvet for smaller beds. Little ones won't miss out on the storytelling fun either. Forivor includes a set of Baby Character Cards with prominent black and white illustrations and more basic animal descriptions and sounds. Both the blanket and the duvet come cozily packed in an organic cotton suitcase that can be reused for storage. There's also an impressive wall-hanging that is hand-embroidered by a fair-trade women's cooperative in India. The detail is stunning, and the piece would create conversation whether in a child's room or yours. If you have bedding covered, Forivor Kickstarter perks also include coloring posters and greeting cards. Forivor was designed to get families thinking and dreaming about nature, and the company has done its homework in forging a philosophy with the planet's well-being at the forefront of its mission. Forivor's bedding is produced using pesticide-free organic cotton that has been cultivated using rain water, and the character cards are created by an environmental printer. Forivor's current line focuses on bedding, but plans are already in the works for a wide range of interior products. In other words, the company is aiming to make your days and nights as dreamy as humanly and humanely possible.